When we use a Windows account, we have to use a user name and a password to be able to access the operating system, which isn't very safe if someone finds out our password, but now thanks to KeyLemon, it will also be necessary for us to be in front of the computer for it to startup. The program will recognize our face through the webcam so that if someone tries to access the computer, and the application doesn't recognize him/her as a user, he/she won't be able to access the system. The application is also capable of checking if we're in front of the PC every certain amount of time, blocking the system if we aren't in front of it during one of the checks. The way it works is very simple, because after configuring the application by means of its comfortable assistant in five steps, we'll only have to modify the control times and how it performs the blocking action. 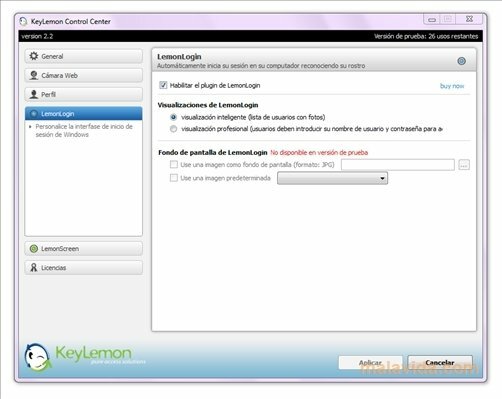 If you want to gain security and you don't want anyone to have access to your PC, download and install KeyLemon. It's necessary to have a webcam installed to be able to use the application. The trial version can be used for 4 days.